We focus on relatively inaccessible, rural poor floating communities and those on the floodplains of the Tonle Sap and Mekong River. The Tonle Sap Lake is the largest freshwater lake in Southeast Asia and is also one of the most productive captive fisheries in the world, providing more than 60% of the protein intake for the people of Cambodia. 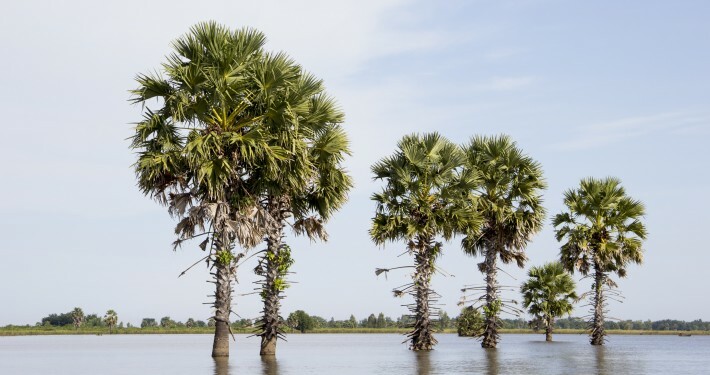 The flow of the Tonle Sap River changes direction twice yearly, with the Tonle Sap Lake expanding and shrinking by 5 times its size with the changing seasons. 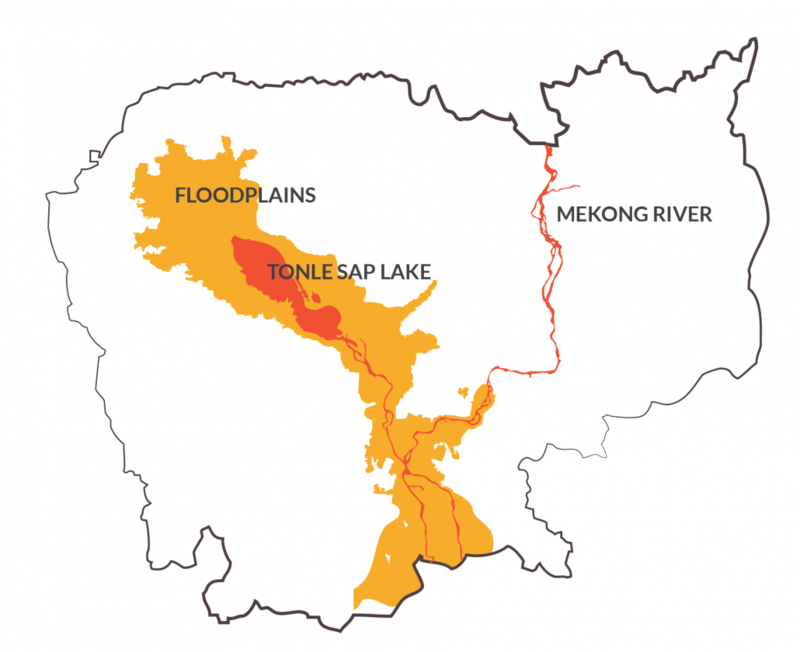 During the wet season, the Mekong River inflows into the Tonle Sap River forcing the waters of the river back into the lake and inundating the surrounding forested floodplains. The vast wetland formed due to this annual cycle, supports an extraordinarily rich and diverse eco-system. In 1997, the Tonle Sap Lake was recognised as the first Biosphere Reserve in Cambodia. Floating communities clean, bathe and defecate in the river they live on. Most of them are fishermen, depending on the heavily polluted river for their food and livelihood, as well as its waters for drinking and cooking. Communities on the floodplains also rely on contaminated surface waters for drinking as they are unable to utilise groundwater aquifers due to the annual floods. Relatively cheap forms of readily available traditional water and sanitation infrastructure, like pit latrines, wells and community piped water supplies, are not suited for use in conditions of constant inundation. This makes it difficult for communities living in this area to reduce contamination of the waters that surround them, in turn worsening the quality of their available drinking water as population grows. There is limited space for collection and storage of rainwater due to the conditions in which the rural communities are sited, especially in the case of floating villages. Those on the floodplains have to devise stilted platforms to store rainwater, which may be prone to contamination during the floods due to leakage into the pipes. 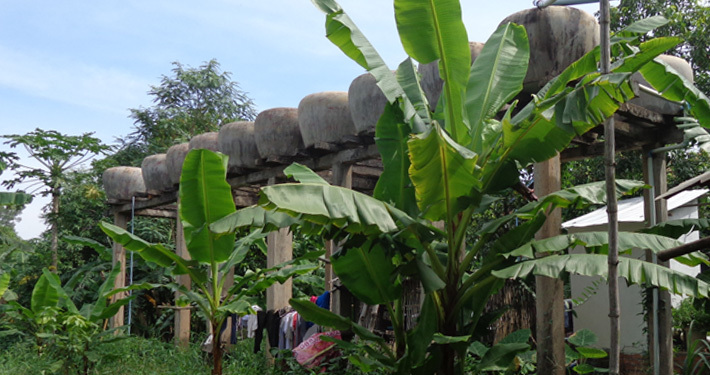 This reduces the amount of relatively clean water that households can harvest during the wet season for their daily use. To address the water challenges in Cambodia, we implement clean water projects under the Community Water Enterprise programme. Working closely with the Provincial Ministry of Rural Development and selected commune councils, we build water treatment and bottling plants located within the communities and which are subsequently owned, operated and maintained by the communities upon completion. Simple corrugated metal clad structures are built on concrete stilt platforms to house the water treatment system and provide some space for cleaning the bottles. The stilts can be as high as 4metres to prevent annual floodwaters from damaging the equipment inside. A simple rapid sand filter system is used to treat water that is pumped out from nearby ponds or rivers. Water from these sources are tested to ensure the contaminants can be removed with this system. The contaminated water goes through a complete treatment process with sand, activated carbon and finally ultraviolet radiation removing the biological contaminants present in the water. Partnering with commune councils, a water management committee is set-up and a water entrepreneur selected. Training is then provided to all parties on water facility management. The selected water entrepreneur is trained in basic business skills (to deliver the water service) and how to operate and maintain the equipment in the long run. The Ministry of Rural Development partners with us to conduct health and hygiene awareness as well as clean water promotion campaigns to the villagers. Clean, treated drinking water is sold in 20 litre bottles that are easily transported by boat, bicycle, motorcycle or wooden cart. The bottles are brought back to the plant to be washed and re-filled once it is emptied.